According to Sperian Protection, a supplier of personal protective equipment (PPE), it is important welders wear appropriate head and facial protective equipment. Welding and grinding are responsible for over 29% of all eye injuries at home and in the workplace, so the use of suitable protective welding headwear is essential to minimise these injuries. Offering welders face and head protection, the Sperian Protection range of high impact welding helmets and accessories protects welders against injuries like flash burns, UV / IR radiation and fine particles and vapours. 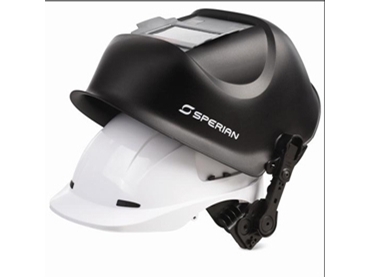 Designed with a range of safety features, such as a sensor bar and slide, sensitivity function, delay function, shade level and girding mode, the Sperian range of welding helmets provide comfort and on-the-job performance for professional welders. Providing welders with a complete safety solution, the Sperian Optrel Galaxy High Impact Welding Helmet now comes in a hard hat adaptor version to suit PA620V and MSA V-Guard Elite hard hats, and provides maximum protection and comfort for the head without the need to switch helmets and hardhats. To eliminate the need for the welder to switch from a welding helmet to a visor when grinding, the Sperian Optrel Galaxy High Impact Welding Helmet features a passive Shade 10 welding filter in a flip up adaptor. The Sperian Optrel Galaxy High Impact Welding Helmet is approved to High Impact AS/NZS1337:1992 for increased safety during grinding and welding applications.